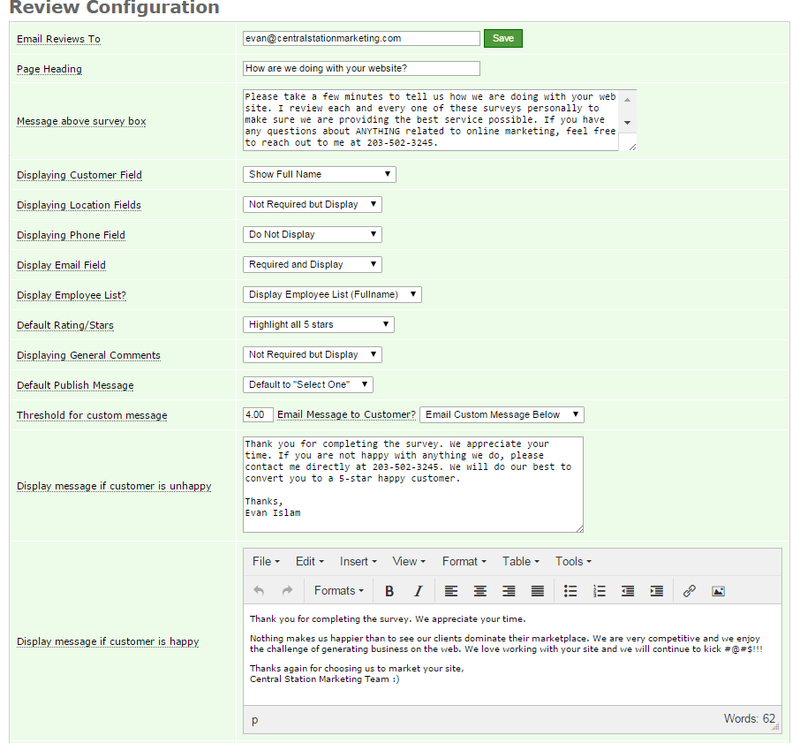 You have full control over what gets displayed on your review system. Of course, anything and everything can be customized but below are a few things that you can configure yourself through the platform. Email Reviews To: Enter as many emails as you need and separate by comma. After each survey is complete, the system will email to whoever is listed on this field. Page Heading & Message Above Survey Box: Enter the title of your survey and a message to explain why the customer should fill out the survey. First Name and Last Initial ex: John S.
Initialize full name ex: J. S.
Location Field: This is great if your business is local. This should be a must if you want to rank for local keywords. We only ask for City, State and Zip. Phone & Email Fields: You can make these required or optional. We never make these info public. These are handy to validate if the survey is from a real customer or not. Displaying Employee List: Do you want to know how your individual team members do with the customers? Set this to yes and have your customers select the team member on the project and get some good feedback on how he/she performed. Default Publishing Message: This field allows you to set the default permission selector to either "Yes" or "Select One". Why is this important? If you set this to Yes, then there is a highly chance that customers will select yes to publish the review public. If you select Select One, then you are double checking to make sure that the customer wants to make the review public.